Proper planning and strategy is mandatory for better interview preparation. 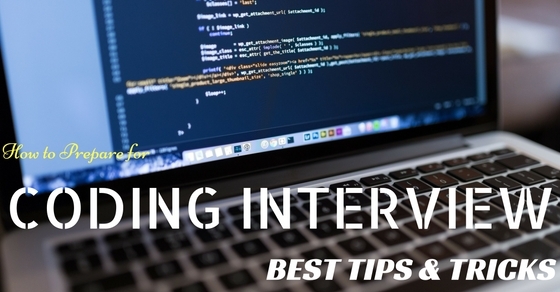 While preparing for a coding interview, try to learn the basics and make sure that you are thorough with it, as conceptual questions can be asked in such coding interviews. Try to boost your confidence and believe that you can pass the technical interview even if you are not from a computer science background. Always keep in mind the mediocre and generic questions such as “why do you choose this company?”, “do you think you are deserving for this position?”, “what qualities makes you stand out from others?”, “what are your strengths and weaknesses?”, “what are your hobbies?” and so on. These questions are usually asked by the interviewer so as to create a basic outline about the candidate and what all are his interests. Also, these are great warm questions to prepare, and any individual going for an interview should expect such questions, as they will be asked for sure. This step should be followed for all kinds of interviews and not just for coding interview. Whenever you get the time try to brush up your previous knowledge and try to learn and revise what you have studied in the past. Brushing up your knowledge and strengthening your fundamental knowledge is necessary for an individual to give satisfactory answers to the interviewer. If the interviewer is a seasoned and a well experienced person, take extra effort in revising the basics. Many people are confused by the most basic questions during an interview, just because they properly did not study their basics and fundamentals. Try to make sure that you have a strong foundation in the essentials of computer science. By brushing up, it does not necessarily mean to read the whole thing starting from the beginning. Instead, go through basic structures and algorithm so that they are refreshed in your memory and you get the clear understanding of the essentials. Try to create a summary of what you have studied and go through it systematically. When you are attending for a coding interview, to check the coding ability of the candidate, the interviewer asks the candidate to create a code based on a certain scenario. Here the candidate exercises his problem solving and decision making abilities. The main purpose of such a test is to check whether the candidate can create a program with as very little bugs as possible and it should be really efficient. Try to consider the various options, decisions that should be taken, how to select priorities and what aspect should be given the more weightage. This shows the clear mind of the candidate, ability to solve problems and also to communicate the scenario to the interviewer through the code. Glassdoor is a website that gives truthful reviews about companies like Google, Yahoo etc. In reality, Glassdoor helps us to get an idea of the company through the opinion of its employees. Also, it is a great site to see the recent interview questions that the interview panel of the company has asked the candidates. Do not expect to find the same questions as such, but instead by reading and understanding these comments, you will get an idea of what the company is trying to find through its candidates. Try to understand what kind of questions they are asking and try to figure out what your weaknesses are while answering these questions. In this way, you are getting a chance to correct yourself and to improve yourself in many ways. Mock practice is one of the important interview tips. Try to mentally prepare yourself as much as you can for the interview. This is necessary since you have to be ready to face any type of questions especially if you are going for an interview conducted by top tech companies such as Google and Yahoo. Try to be more confident and sure that you can pass the interview. The main aim is, if you have friends working in large tech companies, then try to ask them what kind of questions they ask the candidates during interviews and collect information regarding it. Beg for them for mock interviews. Also, you can use sites like Gainlo, to prepare for employee interviews for Google and Amazon. Mock interviews can help you to recognize your weaknesses and helps to overcome nervousness. This is the main aspect that most programmers and coders tend to forget. Most of the coders think that the main purpose for them is to write the necessary code and programs. But the code should be tested and checked with respect to the various industry standards and practices. Those candidates who bring up the topic of testing easily impress the interviewer and can get you grace marks. Try to learn about the importance of checking the finished code and explain to the interviewer why coding is considered as a necessity in this technological day and age. When attending a coding interview they are bound to ask you to write codes on a platform that may be different from your code simulator or IDE. These can make you feel intimidated or uncomfortable if you are not familiar with such platforms. If you do not have much prior experience in such interviews, then at least try to make an effort in getting to know various whiteboard or code sharing tools and websites. Most people complain that writing a code on the whiteboard tool is very much different than writing code on a laptop. This is very much true since whiteboard platforms do not have the option to copy, paste or share codes and also, they do not provide much access to edit codes. They are generally used as a code testing apparatus in various interviews and exams. The main goal in familiarizing such tools is to mimic the environment of the interview as much as possible. This way, you can plan ahead for your interview and can prevent such non-technical problems to happen, that might affect your interview. This is one of the most basic questions that every candidate should be aware of while preparing for an interview, be it a technical or a non-technical one. For many famous companies like Google or Facebook this question will surely be asked. Another reason why is it necessary to research about the company is that many companies follow the culture fit test. You have to persuade them into thinking why you’re fit for the company and why you deserve the job. Understand the aim and motto of the company and try to learn the fundamentals that the company is based on. Also, try to understand whether or not joining the company is a right decision in your life. Try to find companies that resonate well with your aim and motto so that you will enjoy your work and have fun to spend time at the office. Try to be satisfied with your work and try to utilize whatever resources that you have. At the end of every interview, the interviewer will ask the candidate to ask any doubts regarding the interview process as a form of feedback. Many people usually ignore this aspect, but asking a good question can do you wonders for the interview. Try spending some time in researching good questions, as it can be a chance to impress your interviewer. There is no clear distinction between good or bad questions. Also, asking such questions will give the interviewer how much you are keeping up with the present time and technology. Also, if you do not find anything suitable to ask, you could ask simple questions based on the technology used, infrastructure and other formalities of the company. Also, do not ask any feedback regarding your performance in the interview. If you have any friends present at the company that you are giving the interview, ask them for details regarding the interview process and also give stress to what all aspects they check within the candidates. For each company, they have a select Performa that they follow in choosing the candidate. For example in Facebook, they usually ask the engineers about product sense and how it affects its users and collects feedback from them. In the case of companies like Airbnb, they ask the candidates questions to make sure that they have the same passion as the company and they are willing to make a mark within the company with their stellar performance. If you get any relevant information from the company, then you are bound to make a good performance in the interview. Try to find clues that are potentially useful to the candidates and can be useful for them at the time of the interview. There are two aspects in this point, one is managing time when you study and another is when you manage time doing a code. In the first case, try to make sure you have enough time so as to carefully prepare through previous notes and basics. The usual time taken by candidates is a minimum of one week. Try to create a schedule and strictly follow to that schedule. The schedule should be made in such a way that there is enough time for the candidate to just read through most of the basics and still have time to do codes and programs. The second aspect is solving your problems within a time limit. Try to always keep a timer beside you when you are practicing writing your codes. You won’t know how much time one takes until you start tracking the time you take per code. Try to increase the speed in which you write your code. Try to set a time limit, so that you are more accustomed to solving a problem within a time constraint. This way you won’t feel tensed or under pressure under a time limit. In any case, which includes exams and interviews, try to sleep well and do not compromise on the time allotted for sleeping. It is necessary for the body, especially the brain to take some rest after studying for long hours. Always sleep 4-6 hours and try not to sleep less than that. Working hard after 12 am is not advisable since most interviews happened in the forenoon and the afternoon. By the time the interview starts, your whole body becomes tired and you won’t be able to focus completely on the interview. Hence to solve that, try to sleep as much as possible. If you have too much work, then try to wake up earlier and do your work. In addition, if travel is needed for any on-site interviews, then it is necessary to allot some time for traveling and resting. Always try to make use of the various text materials and website that provide you an insight in the process of coding interview. There are many sites such as leetcode, programmerinterview, geekinterview for getting questions related to coding interviews and even allows users to submit their codes for further review and correction. They also provide other technical questions in various other engineering fields. Also, try to search for various coding interview processes so that you can be more familiar with the different rounds present. In summation, you don’t necessarily have to be an expert in coding just to attend a coding interview. With the proper discipline and planning, a candidate can be well equipped in a coding interview and are able to solve problems with confidence and ease.